A western pond turtle swims in the South Fork of the Eel River in Mendocino County under a sunny sky. I’m unfortunately caring a for a sick box turtle at home, Sammy, a tiny guy my family rescued in 1984. While I work with a vet to care for him, I can’t help but think of how challenging it is to simulate wild conditions in captivity. Create the right wavelengths and intensity of light, temperature, humidity, naturally balanced diet… We try to do that so our pets will be as healthy as possible, but of course “wild conditions” come along with many perils that an animal like Sammy avoids in his terrarium. 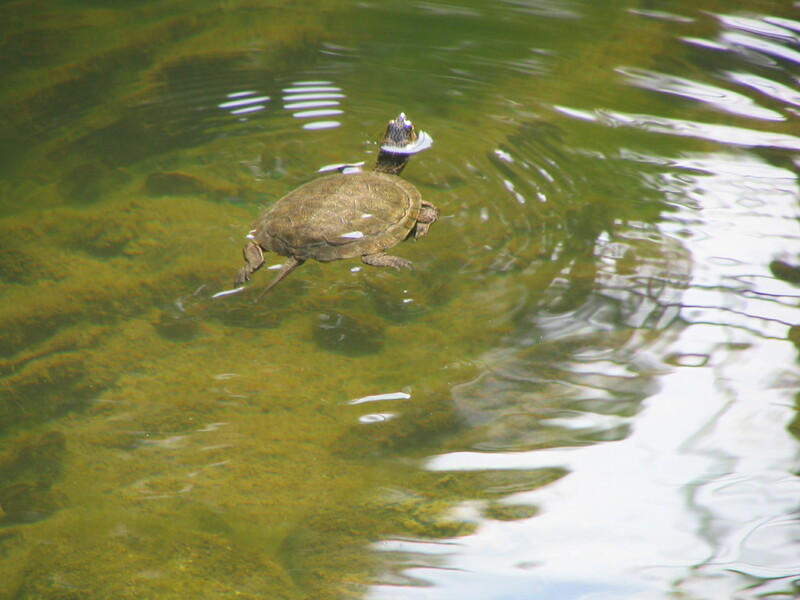 The western pond turtle, a native to the coast redwood forest watersheds I frequent, has dealt with unimaginable challenges since European settlement of California. Matthew Bettelheim shares the history of western pond turtles in his article for Bay Nature, “Native Son – Make Way for the Western Pond Turtle.” Bettelheim reports the shocking history that these turtles were once hunted for food in the Bay Area and as many as 53,000 we taken in 1899 alone. Today they face habitat loss, disease and competition from exotic turtles released into the wild often by pet owners who just give up. This turtle owner won’t give up and is going to keep working on giving Sammy the best life possible inside, a thousand miles from his native range.